I was late cycling in to work today. On passing the The Catholic Church of the Holy Name on Oxford Rd it was impossible not to notice a huge crowd of people near the church and lots of TV and media presence. On arriving at the junction with Booth Street near the Royal Northern College of Music the traffic was held back for the funeral procession. One adult and two child's coffins went past, followed by a large number of funeral procession cars. It was a really sad and tearful moment. As I suspected on checking the BBC Manchester website when I got into work, it was the funeral of Beverley Samuels and her daughter Kesha Wizzart, and son Fred who were found murdered at their house in Fallowfield on the 12th of July. Things are so much easier these days. This afternoon I popped down The Haçienda night club for a quick groove followed by a curry at Al Faisals Tandoori cafe - all in the space of my working day lunch time. The Haçienda was in Second Life of course but the SL Al Faisals was nowhere to be found so I opted for the first life version in the hip MCR Northern Quarter. The Haç was empty so I had to twitter up friends - Art Fossett duly obliging. We checked out the new audio functionality in SL which worked pretty well. We couldn't find an SL 'es' dealer - probably no bad thing. Al Faisals has been there as long as I can can remember. Very much a basic cafe but great cheap food and charmingly grumpy service. Highly recommended. Apologies for the name dropping but last time I was there Anthony H Wilson was in and a few months ago Mick Hucknall. I appreciate this may put some people off going. Sad to see Tony Wilson not looking too well these days. Check it out if you're nearby. I've been off the MCR jam scene for ages now. Last year and the year before I used to go probably every other week or so to the 'All That Jazz' jam at The Arch Bar in Hulme and Po Na Nas when it was happening. The All That Jazz jam has had mixed fortunes over the years as detailed on some earlier posts on this blog. There's been all sorts of rumour mill about what happened but sadly this jam has been shut down since about November of last year. It's a real shame as The Arch Bar was under new management and they'd done the place up nicely with new sofas and even provided a decent PA for the vocalists. However, the council stepped in due to noise issues and installed a noise limiter. This basically cuts the power to the stage and PA if the volume level goes above a certain point for more than a few seconds. When I was based in London playing in a funk band we played at a venue in Camden Town called 'WKD' that had one of these and they do seem to be set to very low volume levels. Anyway, so in Manchester we seem to have three jazz jams now; a latin jam at Lamarrs every Wednesday run by Kirsty Almeida, Ed Kainyek's straight ahead jazz Jam Session at The Kings Arms in Salford also every Wednesday and a monthly one at Matt and Phreds. I decided to give the latin one a go last night, not that I'm especially into latin jazz but thought it would be worth a try. Turned out to be a tough evening and left me quite dispirited. I went down there on my own and didn't really know anyone apart from Richard Iles who I don't know that well. We chatted briefly but he was playing in the house band and with a bunch of other people. I had to wait a while to get a shot as well. First track wasn't too bad but my playing was a little shaky and my timing wasn't great. Next was 'Oye Como Va', a simple tune but the vibe in the group didn't really allow me to have a shot at improv so that was disappointing. Then a couple of other guys got up and went into the standard 'A Night in Tunisia'. At this point I crashed and burned and had to step out. I left feeling a bit like a useless beginner sadly. I guess it's par for the course and to be expected as I've still got lots to learn in the jazz sphere and I'm clearly not match fit playing live inevitably. Nevertheless it was a bit saddening so I've gotta make sure it doesn't knock me back too much. It's frustrating when you know you can play well but feel like you can't play anything. I've decided that my fave discovery from the Jazz Festival was the great young trumpet player/composer/dj/producer Matt Halsall (check out the fab track 'Sending My Love'). I've blogged about the gig below. He's playing with his Magic Bop group this Saturday at Matt and Phreds so I'm really looking forward to that one. We've exchanged a few comments and messages on MySpace and he seems like a really nice fella as well. His band includes the fab Cinematic Orchestra players, Luke Flowers and Stuart McCallum. He doesn't really attempt to define his music style on MySpace but the Festival website descibes him as "a spiritual, free and meditative player who picks up from where the ‘60s modal explorations of Pharoah Sanders, Coltrane and Sun Ra left off". 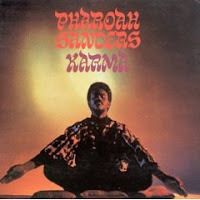 Having been so into the gig I went off to have another listen to Pharoah Sanders and Sun Ra. I'm familiar with some of Sanders contributions to Coltrane's groups but I've never checked his own stuff out. Got hold of a copy of what some websites consider his master work "The Creator Has A Master Plan" from the 'Karma' album. Classic modal stuff that does more or less stick to one or two chords for a good 30 mins. It's intense stuff and there's some curious almost yodeling style singing that's a little dodgy for my tastes but it is really quite engaging. Very reminiscent of Coltrane's 'A Love Supreme' when the groove sets in after the introduction. To possibly state the obvious, there's many styles of jazz and it was definitely the modal stuff that got me into jazz. Miles' 'Kind of Blue' with the classic 'So What' of course - obvious maybe but undoubtedly quite brilliant. Coltrane's 'Crescent' CD was huge for me and I've spent many hours improvising along to 'Spiritual' from the 1961 'Live at the Village Vanguard' record. Matt's material is definitely coming from this direction I think. Mentioning 'modal jazz' got me thinking if I could easily describe what it is without cheating and checking a book. Although I think 'normal' jazz and western music generally are functional and cadential they are still essentially modal in that they generally use one of the church modes, the Ionian mode to derive their basic chords and cadenances. What's referred to as modal jazz also uses the same church modes, usually the Dorian and Phrygian modes. These modes are non cadential and chord sequences based on them tend to be drifty, vague and can have dreamy almost spiritual qualities. The underlying chord sequences in modal jazz will often be very simple, sometimes literally one chord or often just two or three. An example is the Em to F#m sequence on Coltrane's classic take on 'My Favorite Things'. This gives the improviser great freedom but also has it's challenges in retaining the listeners (and your own) interest. A naive view (mine originally and I think many others) is that if you're improvising in D Dorian you can noodle about for ages using the C major (ionian) scale which happens to be the same notes. This sort of works, but the approach has many limitations. We all have to start somewhere.